Several months ago, I received an unexpected e-mail from one Amanda Nelson of Delta, B.C. She wanted to know if I would be interested in sampling the Bresse chicken she raises on her farm with her husband, Matthew. The default answer to an offer like this is pretty clear: When can I get some? 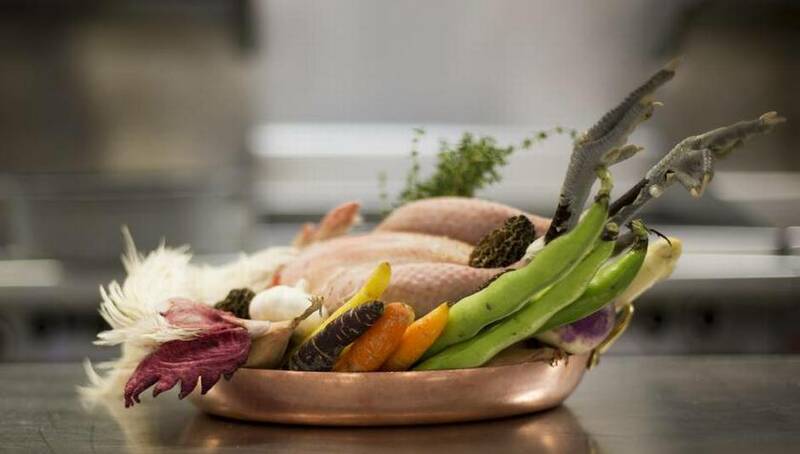 Bresse chicken, renowned for its deep, gamy flavour and succulent skin, is widely considered the finest chicken in the world. But there was a problem. Nelson’s offer, however drool-worthy, didn’t make sense. Bresse chicken comes from La Bresse, France. It is, like the very best French wine and cheese, an AOC product, which is to say, rigidly controlled by the French government. True poulet de Bresse may only be raised in the region of Bresse, and only from the local breed of chickens, Bresse gauloise. These special chickens are reared outdoors for several weeks, so their flesh is infused with the flavour of all the local bugs, leaves and seeds that grow in Bresse, before finally being fattened on a diet of grain soaked in buttermilk so that richly flavoured flesh becomes wrapped in a layer of succulent fat. Since chicken from France can’t legally be imported into Canada, the stuff is basically contraband. So what, exactly, was Amanda Nelson hawking? The answer: poulet de Bresse de Delta. The Nelsons raise the same variety of chickens grown in France, and in much the same manner – on pasture, after which the birds are fattened on grain and buttermilk. Matthew Nelson even goes to the trouble of sprinkling lime on his fields to create a more Bresse-like pasture. What the Nelsons were offering me wasn’t a taste of the best chicken in all of France so much as a vision of what Canadian chicken could be. Because, make no mistake, apart from some of the black-skinned silkie chickens for sale at Chinese grocery stores and the odd heirloom chicken coming out of Quebec, Canadian chicken is the blandest, most commodified meat we have. For this, we can thank the government-imposed supply management, or “quota,” system, which forces would-be chicken farmers to buy market share. In my home province of Ontario, small farmers can raise no more than 300 meat chickens, and they can’t be sold anywhere other than from the farm. 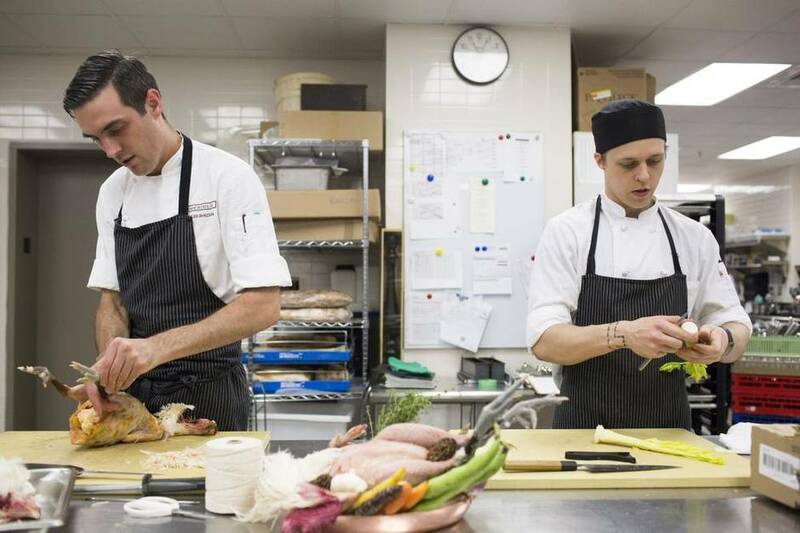 Tyler Shedden, left, and cook Nicholas Ross prepare La Bresse chicken at Café Boulud in Toronto in June. Farmers are free to raise pork and beef, and thanks to this economic freedom, Canadian food-lovers have been seduced by the flavours of pastured pork and grass-fed beef over the past decade. Chicken, however, remains firmly in the cardboard era. It took more than six months for the Nelsons to deliver on their offer. The winter in Delta was cold and rainy, and Matthew didn’t think the chickens fattened well. He started all over again in March and by mid-summer, he had a batch he was willing to stake his reputation on. That gave me time to find lunch companions. One of them was the winemaker Norman Hardie, who, in the late eighties, worked for the French chef Jean-Pierre Billoux and fell in love with poulet de Bresse. The second guest was Tyler Shedden, who is the chef at Toronto’s Café Boulud and trained under the great French chef Daniel Boulud. Shedden consulted the master on how best to prepare Poulet de Delta. Boulud’s advice: Keep it simple. He recommended poaching the bird in a mild stock, with root vegetables, bay leaf and thyme. We chewed, sipped broth, and then did it all over again, as though to see if what just happened was a dream. A few weeks ago, the buttermilk-fattened Poulet de Delta was lying on a counter in Shedden’s kitchen, and Shedden was admiring the deposits of fat in the bird’s cavity, which looked like little ice-cream scoops of Irish butter. Hardie zeroed in on the bird’s feet. “Those are identical to what we got in France,” he said. A pot of mild chicken stock was simmering on the stove. Shedden immersed the legs and thighs. Forty minutes later, he added some root vegetables, several sprigs of thyme and, last, the breasts. It cost the Nelson’s $800 to import a flock of gauloise chicks from a breeder in Florida, and the broth alone was worth every penny. Shedden poured it into little tea cups and we sat there sipping, marvelling at the chickeny aroma and uttering more than one broth-induced profanity. 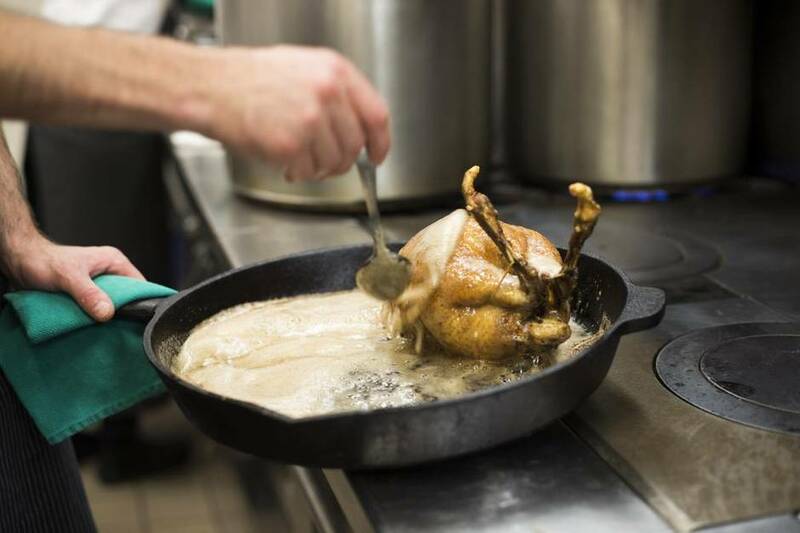 Chef Tyler Shedden spoons butter as he roasts Bresse chicken at Café Boulud in Toronto in June. After a time, chicken reverie gave way to chicken analysis. Compared to normal chicken, the poulet de Delta had a fat, unctuous skin beneath which lay flesh that was firmer than regular chicken, but not tough, with a flavour that managed to be strong yet in no way off-putting. It reminded Hardie of wine that has not been sterile-filtered. “If there’s no texture,” he said, “there’s no medium to carry the flavour.” Shedden remarked on the sticky, glutinous quality of the skin, and wondered why it was that in North America, only the Chinese seemed to appreciate the textural nuances of poached chicken. What’s the possibility of Shedden putting poulet de Delta on the menu at Café Boulud? Right now, the Nelson’s production is so small they use a provincially inspected abattoir, which makes it illegal for them to sell their chicken in other provinces. Without quota, they can only raise 2,000 birds a year, which is tiny by poultry farming standards, and they can’t produce more without buying quota, which would put the cost of each bird well over $20 a kilogram. In Ontario, the situation is worse. Even if a small grower buys chicks from the Nelsons – they’re going for $19 each – and raises 300 of them on pasture and fattens them with buttermilk, they are still prohibited from selling such a chicken to a restaurant. For people in the Vancouver area, my advice is to get one of these birds by visiting the Nelsons farm. For every other Canadian, the best way to taste poulet de Delta, or the nearest thing to it, is to hop on a plane to France.